Book online with one of our two partners below! When people visit Put-in-Bay Ohio, their principal method of transportation to get around the island is a gas-powered golf cart. Bringing a personal vehicle to the island is highly discouraged because parking downtown is VERY limited. Some locations don’t have any parking at all! And what little parking is available is usually sized for small golf carts, not big cars. Finally, the additional expense of bringing a car (over $40) and the possibility of waiting a few hours to get a car on to the ferry to get to the island and then back on the ferry to get off the island can be a major inconvenience and a big waste of your vacation time. That’s why Golf Carts are so popular! Our Golf Carts are available during the warmer summer months of the year. We have high quality brand new Yamaha Golf Carts that rent out hourly, daily, and overnight. With more than 9 miles of paved mostly flat roadways, riding a golf cart is a fun, easy way to explore the Village of Put-in-Bay and the rest of South Bass Island. Our 2 person electric carts are a fun and quick way for couples to cruise the island for the day. If you’re bringing the kids, our 4 seat electric will be a big hit also. Our carts are super safe with retractable seat belts to keep your precious cargo safe and secure. Total relaxation with this smooth and quiet ride. All Put-in-Bay Golf Cart Depot carts are powered locally by Crown Battery, Fremont, Ohio. Our 4 and 6 seat gas carts are your passport for overnight and weekend or all week long rentals. We have a newer fleet of Yamaha fuel injected carts that will enhance your visit to our island paradise. At over 35 MPG, running out of gas is never an issue for your multiple day or weekly golf cart rental. These carts leave all the others eating dust! If you really want to step up your game, try one of our CUSTOM YAMAHA Adventurer Sports. These carts offer a 3 inch lift kit, sporty tires and wheels with a fold down back seat for hauling groceries or gear if needed. These are the finest rentals available on P.I.B., offering a great value in your overall vacation experience. New for 2018, we are offering an ELECTRIC ASSIST BICYCLE for a new way to see the island. Get your exercise, but have some help along the way. These will be on a limited supply basis, so please call for info about both the Bicycles and the Golf Cart Rentals. PutinbayOnline.com also recommends Delaware Cart & Bike Rental for all your rental needs. Put-in-Bay, on South Bass Island, can be traveled at your leisure in your very own rented 4-, 6-, or 8-person golf carts hourly, daily or overnight. 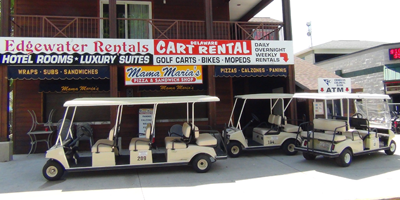 In fact, we are the only overnight golf cart rental facility in all of downtown Put-in-Bay! With a little over 1,000 golf carts available for rent and over 10,000 people visiting on any given day, reservations are strongly recommended and may be made online using our form below. Larger Golf Carts in the 6 & 8 passenger configurations sell out very quickly as they are very limited in quantity. Delaware Carts’ Golf Carts are licensed as motor vehicles on South Bass Island, and driven on public roadways just as cars do. They are designed in 4-, 6-, and 8-passenger configurations. All carts feature tops, windshields, headlights, turn signals and seat belts and are fully licensed and inspected. Delaware Carts rents by the hour, day or week and is the only overnight rental on the island. All golf carts from Delaware Carts are gas powered models. Gas powered carts are faster, run for days on a single tank of gas, and do not get slower as the day goes on (as electric golf carts do). In fact, electric carts were only designed to run for a couple rounds of golf and are not as durable as commercially built gas-powered golf carts. Delaware Carts is located at 266 Delaware Avenue, just a short walk from the downtown Jet Express ferry. Advance reservations may be made by completing the secure form below and any cancellations done by e-mailing reserve@putinbaygolfcarts.com. You will receive an e-mail to confirm your reservation. $12.00 per hour $50 per day. $12.00 per hour $60 per day.